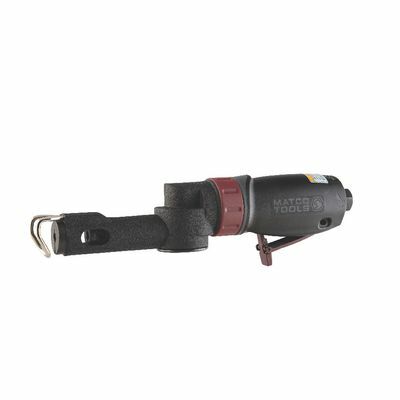 Stroke length 10mm or .4"
GEAR DRIVEN AIR SAW is rated 2.6 out of 5 by 9. Rated 1 out of 5 by Ren8238 from Not as good as I thought it would be.. It's a really powerful saw, but it would often get stuck about %70 of the time. Wasn't very smooth for what you're paying compared to other saws in the same price range. Cutting threaded bolts with this saw was a chore, as it would seem to jump between threads while cutting. Really made it difficult to make an accurate cut because of it. I personally would not recommend this product. Rated 1 out of 5 by peetiewonder from Overheats and breaks every time I use it. This saw was all the hype when I bought it and I was very excited to get it. Excitement quickly turned into disappointment as it overheated the first time I used it then broke the second time I used it cutting through some .120 tubing. It didn't last 3 cuts before it overheated and seized up. I tried letting it cool down but it was DOA. I couldn't get a refund for it, so I sent it off for warranty but needed an air saw in the meantime and bought the Snap-On PTS-1000 dual chuck and have not been let down once. Now this thing sits in my toolbox taking up space and rarely gets used because I know it's just going to be a big letdown. I actually pulled it out today because I was cutting some 1/8th plate and to my surprise, it let me down again. It is absolutely powerful but it's so powerful it just kills saw blades and makes it hard to actually get any work done. Save yourself the hardship I've endured and buy something else unless you need something hard and heavy to throw at people you don't like because as a tool it's pretty useless. Rated 1 out of 5 by JohnnyJ from Constantly breaks. 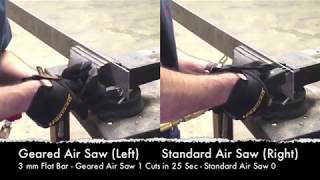 This is an amazingly powerful air saw. Unfortunately it is in fact so powerful that it destroys its-self with nearly every use. The piece that holds the blade has broken two out of six times I have used it. Once while cutting plastic!! Rated 4 out of 5 by madcreationsnet from Great torque for air saw I am a customizer and work a lot with fiberglass and sheet metal. The saw starts up 99% of the time, even under load. I like it a lot. Favorite saw ever. Rated 5 out of 5 by Rstauto from Tears through everything I put in its way Everything I cut it goes through with out stopping. Doesn't get hung up ever! I have waiting my whole professional carier for a saw like this.